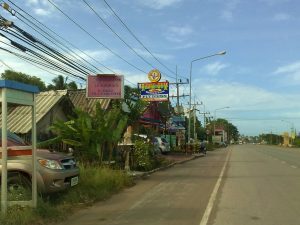 Rawai Gym Phuket - Cheap & Cheerful Gym - Check out the reviews here. Rawai Gym is a Thai owned gym, its as close as you will get to a Rocky Balboa style gym, equipment is good & strong quality but there isn’t any Air Condition which some people prefer but others might find it hard to workout in the heat and griping the equipment with sweaty hands can be hazardous. The gym doesn’t have much in terms of social media or even a website to show you what its like… All there is, is the photos below. Rawai gym is a Cheap & Cheerful gym for short term visits, at only 100 baht per day. Rawai Gym is located on Visit Road, if you were heading towards Rawai Pier it would be on your left hand side. You can park your car on the street outside of the gym and there is a space to park bikes/scooters right outside the gym. How To Rate For Rawai Gym? You can vote for Rawai Gym on its different categories – Just click on the stars to rate it each one. Below will be the average rating generated not just by your votes, but by everyone else as well. Feel free to leave a comment and share your experience training at Rawai gym. Give them feed back and advice for their new clients.